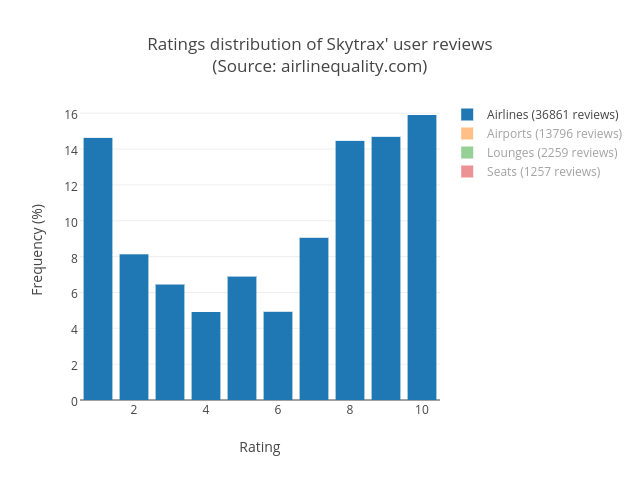 Quankiquanki's interactive graph and data of "Ratings distribution of Skytrax' user reviews(Source: airlinequality.com)" is a histogram, showing Airlines (36861 reviews), Airports (13796 reviews), Lounges (2259 reviews), Seats (1257 reviews); with Rating in the x-axis and Frequency (%) in the y-axis.. The x-axis shows values from 0.5 to 10.5. The y-axis shows values from 0 to 16.737130528771672.